It's been a week since my Power Plate my5 arrived. So far: YEA. I haven't lost inches, I didn't expect to in a week. I don't know if I've lost weight (I haven't had a scale in my house in 10 years), but I expect not. But I do have that lovely long and lean feeling that comes with effective stretching and flexibility. I used to feel like this when I did yoga every morning, a good habit that went by the wayside a year or so back. That routine took an hour. My Power Plate workout is 15 minutes. The one other, unexpected, result is that I've been going to the bathroom .... a whole lot! I didn't make the connection between the dozens of bathroom breaks and the Power Plate workouts until this morning. Reading articles on the UK Power Plate site, I saw that the gentle massage and stretching I'm doing serves as a mild detoxification. It increases blood flow, circulation, and releases toxins from the muscles. And since I'm staying very hydrated throughout the workouts, the combination has led to my multiple departures from all the meetings I was in. Oh well. Maybe it's helped my complexion? Anyway, for the past seven days, I've done 15 minutes each morning of basic acclimation exercises. I'm still disappointed Power Plate was unable to find a certified trainer in the area; I somehow expected there would be several. The incredibly helpful Power Plate PR person, Hailey, was fabulous and did come up with one name in Menlo Park. Not exactly next door, but better than having to go to Los Angeles. There is a Power Plate at the nearby Club One but in typical Club One fashion, they wanted to know if I was going to write about the experience, when, what, etc. Forget it. On a number of occasions I've found Club One's external PR folks to be great. Their internal people have routinely been ...hmmm, dismissive and ineffective. Anyway, a nice Menlo Park person and facility is better than a lousy one close-by. I considered going to the training myself, but the $275 course fee plus travel, hotel, rental car etc deter me right now. 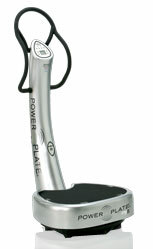 Here's a brief video about the Power Plate, just in case you aren't familiar with it.